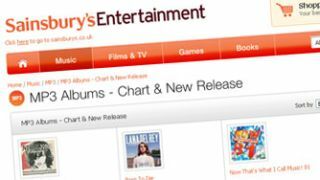 Sainsbury's has opened an online music download store on its entertainment website, replete with 2.3 million tracks. Individual MP3s start from 89p while chart albums will set you back at least £6.99. There's also a deal of the week that will see a £4.99 album hit the site each week. So now you can pick up your pork, beans, milk, cereal and hot chocolate with your Pork and Beans, Milk and Cereal and Hot Chocolate. Oh yes. Every download also nets you Nectar points and Sainsbury's promises lowest prices on pre-ordered items – if the price drops ahead of or on release date and you've bought the MP3 in advance, the supermarket will refund the difference. "This is the first step in our expansion to offer digital entertainment." Sainsbury's is planning more entertainment services to join the music store in the coming months. Mark Bennett, head of online entertainment at Sainsbury's said, "This is the first step in our expansion to offer digital entertainment alongside our existing range of CDs, games, film and books." So expect to see on demand films and ebooks coming to the supermarket soon.